The Swede Martin Wiberg (September 4, 1826-December 29, 1905) was born in Viby, Scania. In 1845 he enrolled at Lund University to study medicine, but for financial reasons turned to the study of science and became a Doctor of Philosophy in 1850. He was very interested in printing business and wished to develop a composing machine. In order to raise money for this venture, he decided to publish a set of interest tables, hoping to use the machine of his compatriot Scheutz for computing and printing these tables. The machine of Scheutz was however sold to the Dudley Observatory, that's why he decided to construct his own calculating machine. He wanted to build similar machine, but that would be much smaller. Wiberg managed to obtain the support of a group of influential Swedes, including the Prince (the future King) Oscar of Sweden, a company under whose auspices the tables were to be created. A successful desk-size machine was built (see the lower photo) and the interest tables appeared in 1860. This enterprise however became a failure for Wiberg, because the tables failed to sell due to their bad looks. For this work, Wiberg was awarded 800 kronen by the Swedish government, received several medals and awards and was noticed by the French emperor Napoleon III. The machine was examined by the French Academy of Sciences, where it received favorable notice, and was described in a special report. 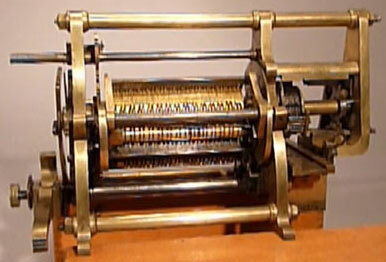 The machine of Wiberg had the same capacity as the machine of Scheutz, it could compute fourth differences of 15-digit numbers. Instead of rectangular array of number wheels, that had characterized the Scheutz machines however, the machine of Wiberg was made more compact by substituting identical metal disks for the counting wheels used by Babbage and Scheutz, and by arranging these linearly along a common axis. This meant that 75 disks were arranged in 15 groups of 5, each group corresponding to the tabular values and the first, second, third and fourth difference, arranged from left to right. A second axis, parallel to the first, carried thirty hooks, which could cause as many of the disks to be acted upon at the same time, making possible the simultaneous addition of two sets of 15-digit figures. 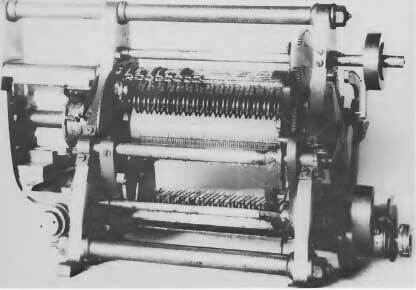 Thus, one of the operating features of the Scheutz machine had been preserved: one turn of the crank caused even differences to be added, another turn, odd ones; carrying was again effected separately, after the rest of the addition had been completed. Results were once more impressed on lead or papiermache, from which stereotype plates could be produced. The academy's reporting committee pointed in his report from 1863, that the machine could do nothing that the Scheutz machine had not done, but commended it for its efficient mechanical construction, which had led to a substantial saving of space and utmost reliability. Wiberg was an outstanding inventor, whose contributions ranged from mechanical letterboxes, heating devices for railroad carriage components, speed controls, match-manufacturing machines to self-propelled torpedoes, and automatic breech loading weapons, a cream separator, etc. 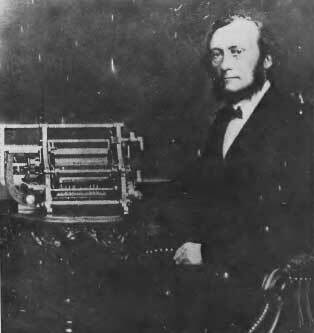 His calculator became especially well known through a set of logarithm tables, which included logarithms of the trigonometric functions, and appeared in 1875. It was published in Swedish, German, French and English editions, appearing in 1876, in time to be included among Sweden's contributions to the International "Centennial" Exposition held at Philadelphia that year, where it joined his "bull-dog apparatus" for deep-sea sounding and railway control device.